Although Newton is a long way from Madison Avenue in every way, we’re all still victims of advertising. Take the word “gingivitis,” for instance. Everyone has heard the word, thanks to Listerine’s hefty yearly advertising budget. The question is, what is gingivitis? 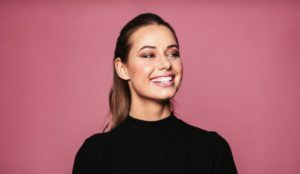 Since we don’t want our patients to develop gingivitis, here’s a primer from your friends at Cosmetic Dentistry Center. Despite its serious name, gingivitis is nothing more than gum inflammation. Plaque is the main irritant of the gums. Plaque is the film that forms on the teeth throughout the day consisting of bacteria, bacterial waste products, food residue, and saliva. When you brush and floss you remove the plaque. Then it starts to rebuild, only to be removed again when you brush. But if you neglect your oral hygiene the plaque can develop beneath the gumline, where it is very irritating to your gums. If allowed to stay there, the plaque hardens into tartar, causing more persistent irritation. While the term “irritation” sounds innocent enough if this irritation is allowed to continue and progress, it leads to gum disease, clinically known as periodontitis. So, how do you know when you have gingivitis? Gum irritation is easy to spot. Your gums should be pink all over. Any bright red patches show irritation. Your gums should also lie flat against the teeth; inflamed gums tend to recede and pull away from the teeth. Your gums will also be prone to bleeding and this shouldn’t normally happen if you’re using a soft toothbrush. Bleeding is a sign of inflammation. And finally, as in the commercials, your breath will reek. The commercials get this part right — your bad breath is caused by bacteria that is being left to its own devices by your poor oral hygiene.  Prophylactic cleaning Twice-yearly cleanings with our office are the first step. Why twice a year? That generally is the time it takes to start forming tartar and other issues that lead to decay. During these cleanings and checkups, not only will those problem areas receive a thorough cleaning, but we will also point them out to you for more attentive care at home.  Scaling If you have a fair amount of tartar built up under your gumline, we will scrape it off with dental tools. This is called scaling, and depending on how much we have to do, we may give you a local anesthesia.  Root planing If we think it necessary, we’ll perform root planing. In this procedure, any tiny grooves or pits are removed from the tooth roots to make it easier for the gums to adhere and stop receding. This is done in multiple appointments with local anesthesia. Now you know as much about gingivitis as the ad men and women of Madison Avenue. And you know how to prevent it. Still, if it’s time for your regular exam and cleaning, or if you’re worried about your gums, contact us at Cosmetic Dentistry Center, (617) 965-7673.